Are you ready for some football? We are giddy with excitement at Eggwhites Catering as we prepare to cater a number of Super Bowl 52 parties in Miami and Fort Lauderdale this weekend! Creating a Superbowl party menu allows us to be a little playful with our game-day catering menus. We love to develop a Superbowl catering menu that incorporates signature food and drink from the regions represented on game day. Read on for recipes and Superbowl party menu inspiration as we gear up for the face off between the New England Patriots and the Philadelphia Eagles. CHEESESTEAK VS. CHOWDER? NOT ANYMORE! Amidst the excitement, Flo from Progressive Insurance asked us to pair up with South Florida-based food bloggers Shay and Steph, better known on the web as @soflofooodie. We prepared a Superbowl 52 party dish Flo created with the help of Foods of Jane. We all know there is one thing that will rise above the intense rivalry this year and that is great game-day food! So in an effort to bring together New England Patriots fans and Philadelphia Eagles fans, this culinary concept is a match made in Superbowl snack heaven - it isn't just New England Clam Chowder or just Philly Cheesesteaks, it's The Philadengland™! These crispy Philly Cheesesteak Bites dipped in creamy Clam Chowder are perfect for game day! Following are the recipes we whipped up in the Eggwhites Catering kitchen for the @soflafoodie duo! Bring the clam juice and potatoes to a boil. Bover and simmer on low for 10 minutes until the potatoes soften. Remove from heat. Add in the onion, celery and garlic. Saute until soft. Stir in the flour. don't let it brown or burn. Little by little, add in the reserved clam juice from the cans of chopped clams. Mix and let simmer on low-medium heat for 10 minutes. Put the steak in the freezer for 20 minutes so it is easier to slice into very thin pieces. Add olive oil to a large skillet on medium-high heat. Add steak and season with salt and pepper. Saute for 10 - 12 minutes. Remove steak from skillet and thoroughly blot the steak with a paper towel to remove a good amount of liquid. Don't skip this step! Chop steak into very small pieces (size of diced onions). Remove any excess oil from the skillet then add steak back to the skillet. Melt the cheese into the steak. Scrape the steak and cheese mixture onto a wax paper lined pan and let it cool. Roll the steak and cheese into balls (a bit smaller than a golf ball). While they are chilling, prepare the batter by following the instructions on the box. Add cayenne, seasoned salt and black pepper to the batter. Heat the frying oil in a large pot on the stove until the temperature reaches between 350 - 375 degrees. Fully coat each rolled bite with the batter and drop them into the hot oil. Cook for 3 - 4 minutes, until the batter is browned and looks crispy. Remove from oil with a slotted spoon and place onto a plate lined in paper towels to absorb the oil. Serve while hot and dip them in or drizzle them with New England Clam Chowder. Take a look at our behind the scenes experience with @soflofooodie. Thanks Shay & Steph! to be found in these parts of the country. 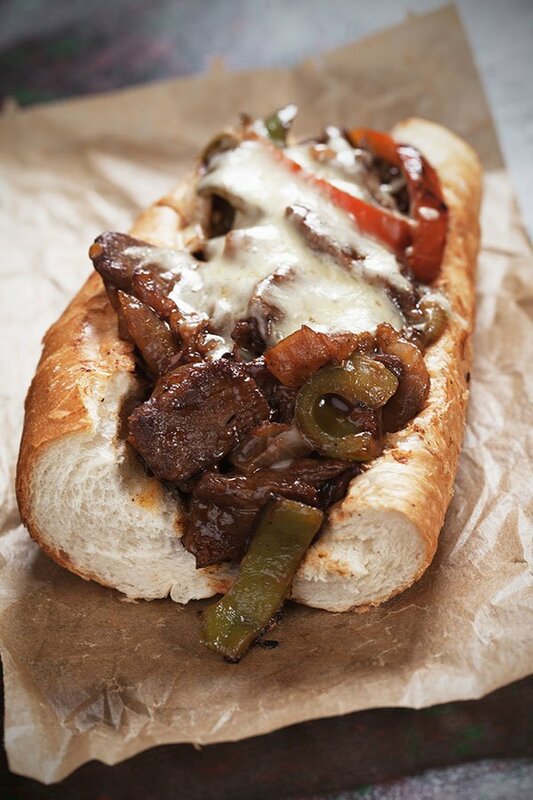 The Philly Cheesesteak - this is what sandwich dreams are made of. Philadephians may be as fanatical about their cheesesteak as they are about their Eagles. The city of Brotherly Love has no problem calling fraud on a cheesesteak recipe that is without the very specific ingredients and preparation method of this cultural icon. Tp break it down, you must use thinly sliced rib eye (to use deli roast beef is considered a crime). The steak is then topped with gooey melted cheese. The cheese of choice is Cheez Whiz but American and Provolone are acceptable substitutions. And don't even think about putting it on any old supermarket roll, it must be on a hoagie roll from an Italian bakery. The art of the cheesesteak is found in the perfect balance of flavors, textures and what is commonly called the "drip" factor. Prepare to get greasy with a good cheesesteak! Many Philadelphians will argue that the Roast Pork Italian sandwich is the true crown jewel of sandwiches. 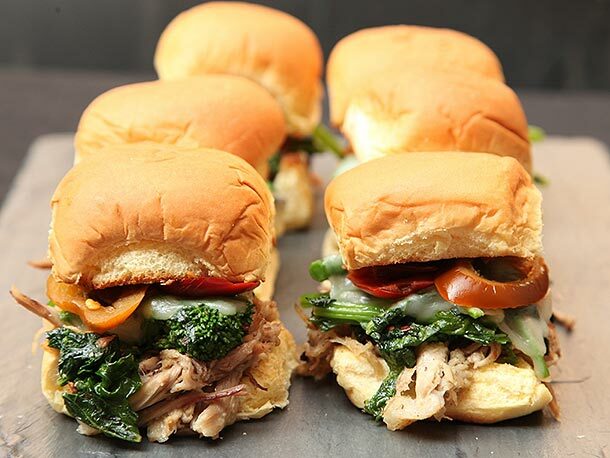 Perfectly seasoned roast pork is topped with provolone cheese, garlicky broccoli rabe sautéed in olive oil and roasted red peppers. Simple yet flavorful, the Roast Pork Italian is worthy of a touchdown dance. The Lobster Roll is the New England summertime sandwich. 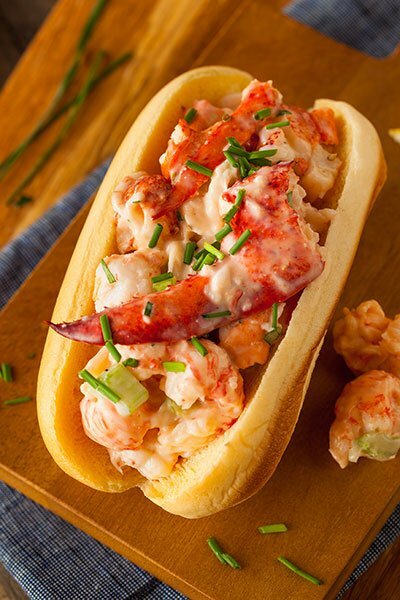 We prefer to serve a mini version of the Maine Lobster Roll which is served chilled and lightly tossed with mayonnaise, tarragon and celery and piled into a bittered New England roll. It's hard to go wrong with a classic sandwich of cured meats, cheese, pickles, hot peppers and a splash of oil and vinegar. In Philadelphia, it's called a Hoagie. In New England it's called a Grinder. most commonly known as the Submarine Sandwich. There are probably as many names for this genre of sandwich as there are regions of the United States. New Orleans has its Po Boy, New York has its Hero. Whatever you want to call it, this sandwich is a perennial crowd-pleaser. 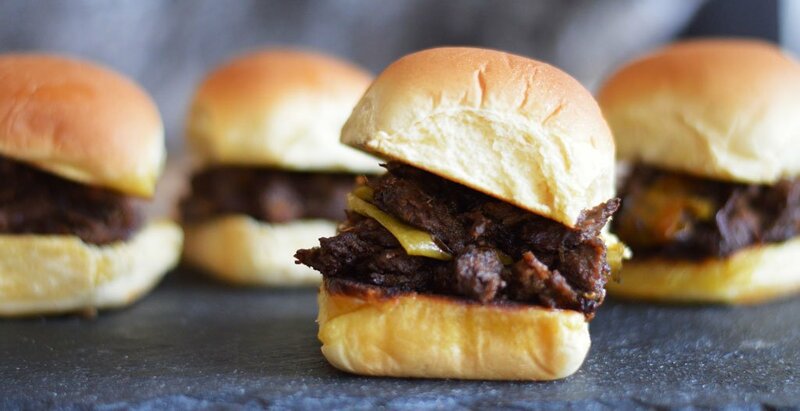 We upped our Super Bowl catering menu ante with some other bite-size dishes inspired by the cuisine of Philadelphia and New England. 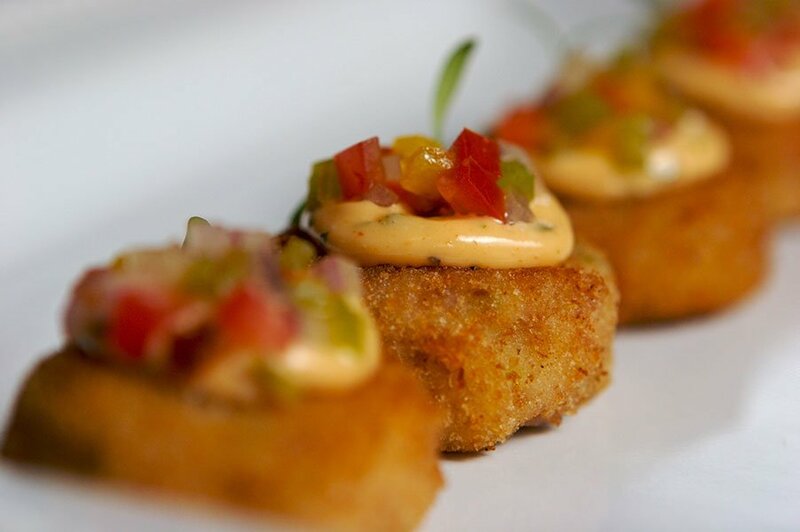 Packed with flavor, a hint of spice, savory New England style crab cakes are a year round catering menu favorite! 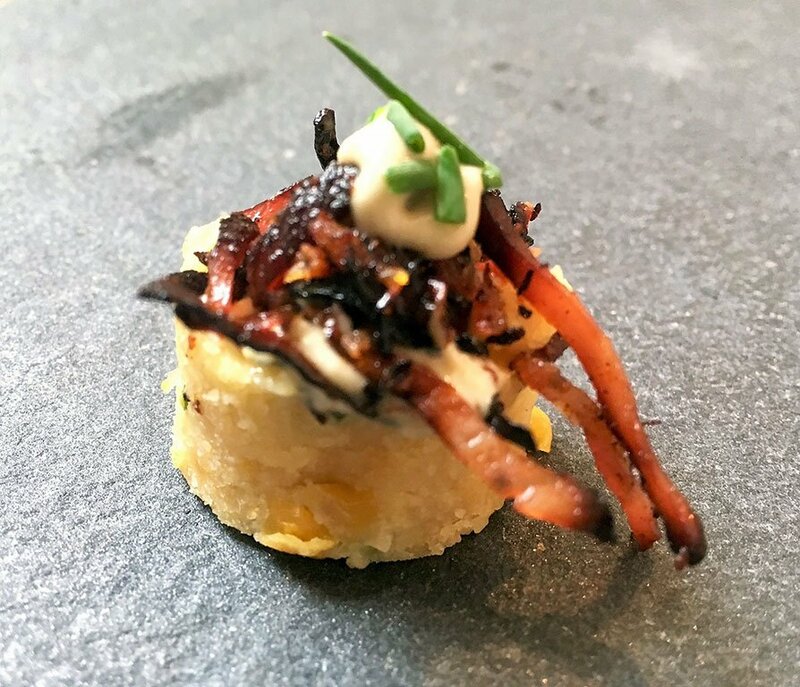 New England's Johnnycake makes a perfect base for our Tasso Ham with Cilantro Crema hors d'oeuvres. Few game day snacks are as iconic as Philly-style soft pretzels. 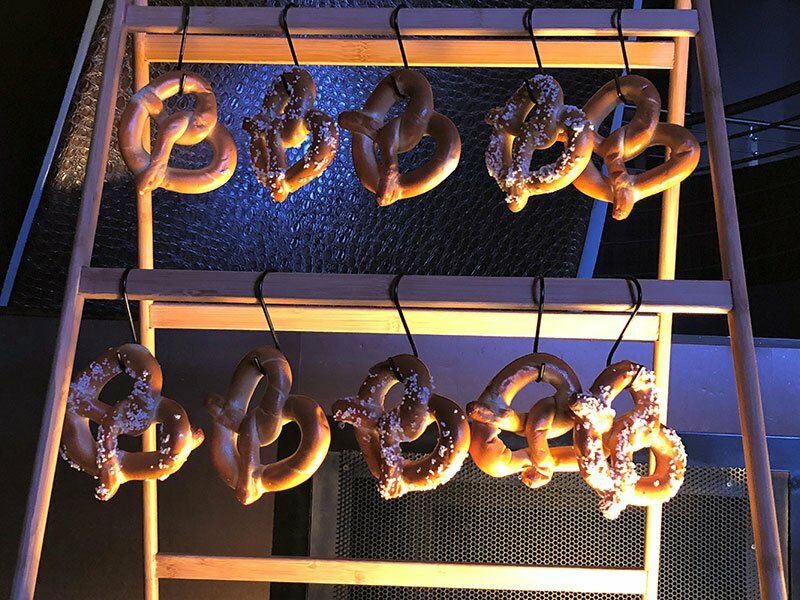 This doughy treat is baked on location and then hung in small batches on heated drying racks so that guests can take in the warm yeasty pretzel aroma. We serve ours with a variety of mustard along with special dippers like beer cheese and smoked salmon mousse for those who want to take the traditional pretzel experience to another level. Every New England kitchen has their staple recipe for this simple crowd pleaser. Comfort food at its best! 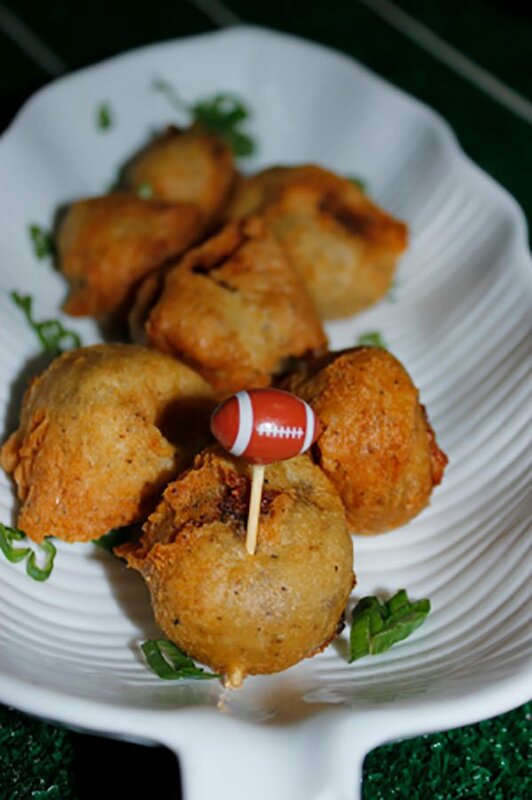 Are you hosting a Superbowl party? As premiere South Florida caterers, Eggwhites Catering can help you plan a talk-of-the-town event. Whatever your theme or whomever your team, we will design a festive menu and party experience that will bring your vision to life. Whether you are just having a few friends over for an intimate gathering or are planning a large viewing party for a crowd, our team of experienced professionals at Eggwhites Special Event Catering will put your mind at ease with our impeccable reputation as a leader in South Florida for luxury catering. Expect nothing less than impeccable attention to detail, professional, personal service and delicious, elevated food! Now sit back, relax and enjoy the game!